Sommetric’s core technology uses continuous negative external pressure (cNEP). cNEP is a comfortable way to keep the upper airway open during sleep. It is actually a very simple concept. Think of the throat as a balloon. A balloon inflates because the air pressure inside of the balloon is positive (higher) than the pressure outside of the balloon. It is the difference in pressure that matters. If the pressure outside is lower than inside, the air molecules will push out against the wall of the balloon and expand it. cNEP accomplishes this by creating a lower pressure on the outside of the throat by using a small collar/cup like device. 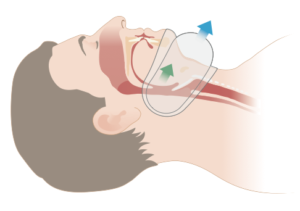 As shown in the cartoon, cNEP holds the airway open from the outside. Sommetrics is developing products for the entire spectrum of OSE, including a prescription product for sleep apnea, and a consumer product for POSE. These products are simple to use and comfortable to wear. They consist of a soft, flexible collar placed on the front of the neck at bedtime. The collar has a built-in vacuum pump, which is very quiet and generates an amount of cNEP, which is safe and effective at holding the airway open. Sommetrics is in advanced testing of its products for both sleep apnea and POSE.